After sitting down with the game for a few minutes early in the show, the folks at Rockstar Games gave me a more in-depth look of their upcoming massive title for the Nintendo DS. Original I only got a chance to spend about 10 minutes with this game on the Comic-Con floor, but that's clearly not enough time, nor an adequate place, to really dig deep and see what it has to offer, especially one as large as this. I saw roughly five missions from the game while also seeing how the GPS/PDA system works. I also checked out early parts of the story. This demo took place in the Rockstar press van at the Comic-Con, which allowed me to hear and see the game much more clearly than on the show floor. Cut Scenes: With the exception of the opening of the game, the mission-start cut scenes I saw weren't very riveting. They mainly consisted of motionless, nicely hand-drawn profile shots with subtitles, which is certainly a step down from the console versions. While no one should have expected a fully voiced game on a DS cart, I'd like to see just a bit more going on in terms of action and emotion to keep me more engaged. Hopefully the missions I didn't see provide that. Radio: While the music in this game is completely original and sounds pretty good coming from a DS, it's mainly just repeating beats and notes. No lyrics. The five different styles of music are Electronic, Hip-Hop, Funk, Rock, and Jazz. Scale: This game is enormous. All the touches you've come to expect from a GTA game are all here. Each building and neighborhood was closely examined and given it's own personality. There's not a lot of repeating textures or copy-and-pasting going on either. Besides being massive in size, it's still a living, breathing city. Pedestrians have their own active A.I., there's some nice physics going on with the cars and environment, and a full day/night cycle. Connectivity: This game not only allows you to upload an insane amount of stats to the Rockstar Social Club to see where you stand with the rest of the world, but you can also trade items and information with your friends, such as drugs, weapons and way points and chat with them in-game on your instant messenger. Makin' Money: Just like today's economy, money is tough to come by in Chinatown Wars. No longer will you be a billionaire halfway through like in previous GTA games. Any expensive item you wish to purchase is going to have to be earned the hard way. Don't worry; there are plenty of extra ways to make some dough besides completing missions, such as selling six different kinds of drugs to neighborhood dealers. Touch Screen: There are a variety of touch screen interactions that you'll come across. These range from filling up bottles at a gas station to make Molotov cocktails, paying a road toll, and even hot-wiring select cars. For one mission I had to actually assemble the sniper rifle I used to assassinate someone, while another time I had to complete a short "Simon Says" mini-game to arm a bomb. They don't seem to be forced on you all the time, either, and they helps break up the gameplay a bit. 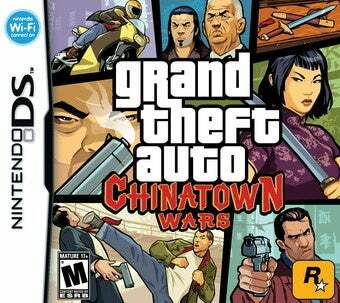 I'm glad I got a lot more time to sit down with Chinatown Wars. I knew this game was big, but not this big. It's an ambitious title for the DS, and one Rockstar seems to be taking very seriously. While I nearly spent two hours with the game, I still didn't feel like I even scratched its surface.